Elizabeth was studying telomeres in pond scum while Elissa was studying chronic stress in mothers of severely debilitated children. Together they showed that the length of telomeres impacts lifespan and healthspan. They showed that factors such as chronic stress, home address and more can shorten our telomeres. They also showed that we have the power to impact our telomeres, potentially ensuring years of life brimming with good health. Telomeres are the capping structures at the end of our DNA in our chromosomes inside the nucleus of our cells. As our telomeres get shorter, our life becomes shadowed with disease and aging on a cellular level. Our telomeres listen to us; the way we live can signal our telomeres to speed up the cellular aging process, or it can do the opposite. The foods we eat, our response to emotional challenges, the amount of exercise we incorporate into our lives, stress we experienced as children, and even our neighborhood address all appear to influence our telomeres. How we live our lives, inwardly and outwardly, individually and collectively impacts our well-being, both on an individual level, and collectively. Doing your part to foster healthy cell renewal will increase your healthspan. 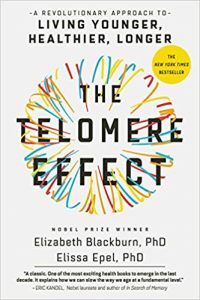 This dynamic book introduces the reader to the profundity of telomere science and its intentional application to reduce chronic disease and improving wellbeing. “Your telomeres…are listening to you…The way you live can tell your telomeres to speed up the process of cellular aging…[or] the opposite. The foods you eat, your response to emotional challenges, the amount of exercise you get, whether you were exposed to childhood stress, even the level of trust and safety in your neighborhood appear to influence your telomeres. …one of the keys to a long healthspan is simply doing your part to foster healthy cell renewal.